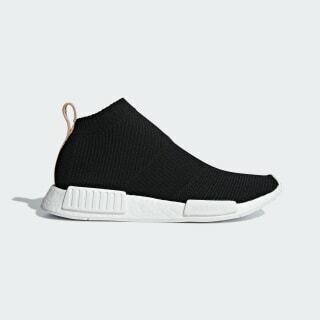 NMD shoes with a sock-like knit upper and veg-tanned details. NMD footwear pushes ahead on its progressive path with a fresh fusion of urban and running style. These shoes feature a two-tone allover stripe pattern divided into vertical, horizontal and diagonal sections. They're built with a sock-like knit upper that hugs the foot for a supportive yet flexible feel.